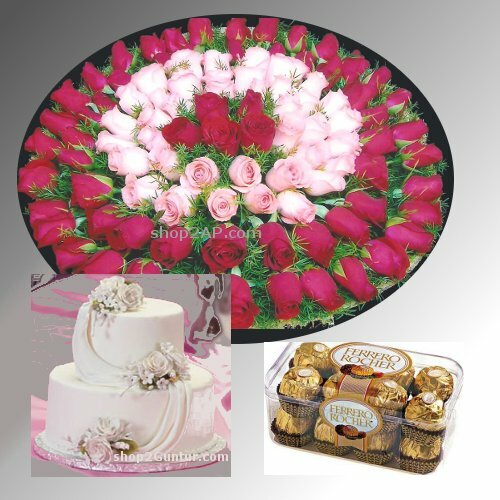 Beautiful 100 Red & Pink Roses in a round shape arrangement, 4KG Butterscotch Cake with out cooling with choice of your own Flavor, 16 pieces Ferrero Rocher Chocolate box.One of our lovely gift hampers is the Roses Elegance-Cake-Chocolates. It comprises of a wonderful and unique arrangement of pink and red roses, a 4 kg delicious two tier cake and a box of 16 pieces Ferrero Rocher Chocolates. Our florist has arranged 100 pink and red roses in a circle with lots of green fillers and this arrangement looks quite pretty. The cake can be chosen from the 6 available flavors (Strawberry, Vanilla, Chocolate, Butterscotch, Pineapple and Black Forest). Send roses bouquet online to your loved ones and surprise them on important occasions such as anniversary, wedding day, birthday, retirement, baby showers, Mother’s Day and Father’s Day and other happy occasions. If orchids are not available we will replace withRoses and Gerberas.